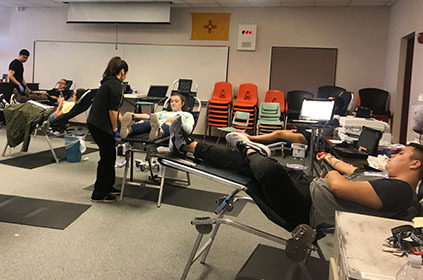 Artesia High School students relax while having their blood drawn Wednesday during a United Blood Services drive at the school. A total of 38 eligible student donors participated in the drive, with 44 pints collected, as seven donors elected to give double. “That is a lot of lives Artesia High School will be saving!” UBS senior donor recruitment representative Stephanie Seabrease told the school.